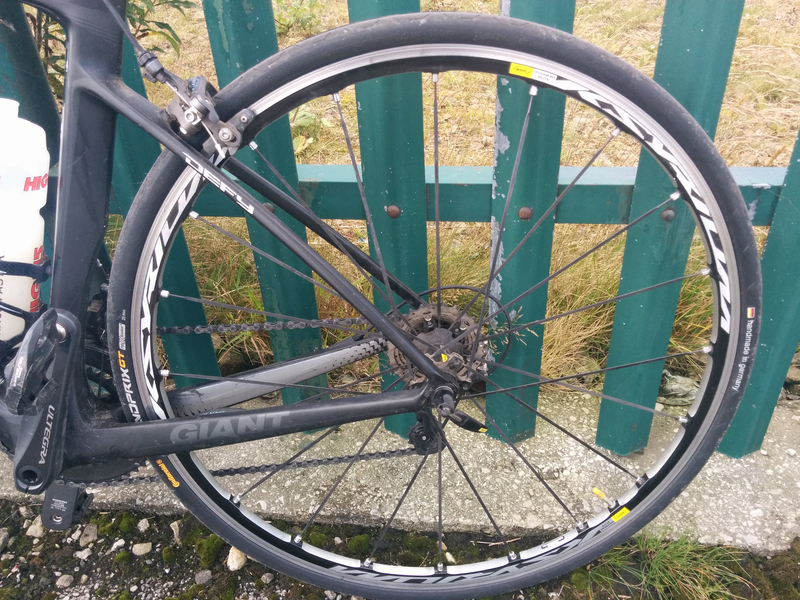 Mavic are without doubt the biggest name in bicycle wheels, their distinctive yellow neutral support vehicles being a familiar sight in the Tour de France and other races – and their rims have been the default option for a whole generation of road cyclists and mountain bikers. But the French firm has moved increasingly towards factory wheelsets in recent years – pushing the concept of the wheel and tyre system (or WTS), which basically means they charge you a bit more and bung some tyres in – which may or may not suit your riding. I think I purchased these wheels in 2012 – just before they became unavailable without the tyres. There’s no mistaking Mavic wheels for any other brand. Although they’re a few years old, the company’s gradual evolution of its product range means a review is still relevant – because not that much has really changed. Weighing in at just over 1.5kg for the pair, they are by no means the lightest you can get for the money (I paid about £350 from a German online retailer), but they are considerably lighter than the stock wheels on most £1k to £2k bikes – which helps make them a popular upgrade. But more importantly than being reasonably light, they’re also significantly stiffer than most wheels of the same weight (and also than a lot of heavier ones). This translates to less wasted energy as the wheels flex in corners, and an associated improvement in handling and responsiveness. The freehub also has a nice quick pick-up. The first bike I put them on was my Boardman Team Carbon – my first road bike since childhood – and they transformed it from a light £1k bike to a light and very fast one. Some riders complain that they’re a bit harsh feeling, especially for aluminium bikes, but I’m afraid I can’t offer an opinion on this – having only used them with plastic frames. I’ve used them on four bikes in total – and on each one they’ve added a welcome feeling of directness and quick power transfer. I’ve moved from 23mm tyres to 25mm ones over the last 18 months and while the 15mm internal rims are narrower than is the modern fashion, they ride perfectly well with the higher volume tyres. I do like the clever way they’ve removed material from the rim in between the spokes. 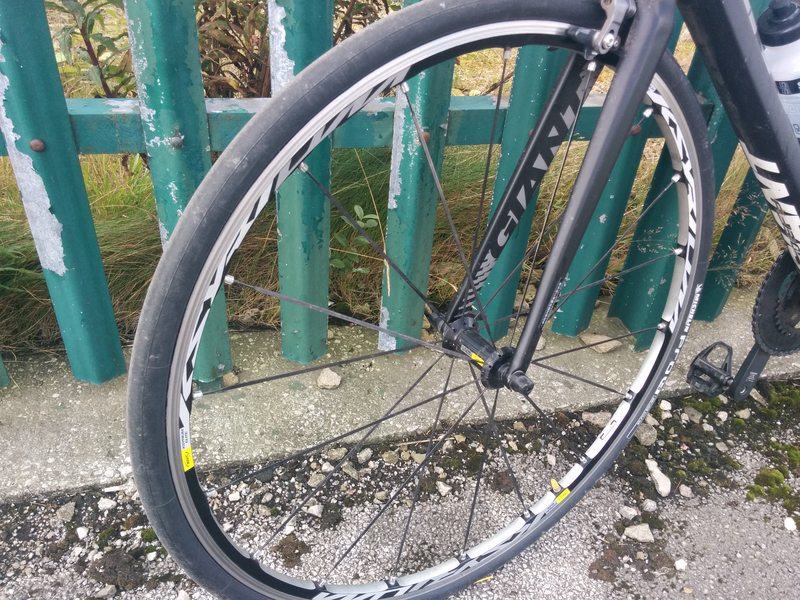 Another common moan about Mavic wheels is that the spare parts are expensive and can be difficult to get hold of. I haven’t had to put this to the test because the wheels have been utterly faultless since new, they’re still on the original bearings and the braking surfaces are holding up very well. For me the Ksryiums are the perfect blend of weight, stiffness, reliability and ride feel. It also doesn’t hurt that they are – to my eyes at least – very good looking. If you need a bit of context, I’m about 74kg and ride a lot more hills than I do flat roads – so I’ve never seen the appeal of a deeper profile (and heavier) rim. There’s now a 2015 model out with a 2mm wider rim – and if anything happened to my trusty Ksyriums I would buy a pair without a moment of hesitation.